Artist's rendering of waterfront apartment building planned on part of a Delaware River waterfront tract where a Foxwoods casino was once proposed, as seen looking east from what would be an extended Dickinson Street. The developers behind a proposed complex of rowhouses and apartment buildings along the Delaware River in South Philadelphia plan to set aside dozens of units for short-term visitor stays. National Realty Investment Advisors LLC of Secaucus, N.J., and Philadelphia-based U.S. Construction Inc. are planning to make 30 units available for short-term use in the two horseshoe-shaped apartment buildings proposed for the southern half of their waterfront development site, according to documents posted Wednesday to the website of the Philadelphia Civic Design Review board. The six- and seven-story apartment buildings, which would face each other across a courtyard, are planned for the southeast quarter of a sprawling tract bounded by Reed and Tasker Streets between South Columbus Boulevard and the river, where a Foxwoods Casino was once planned. 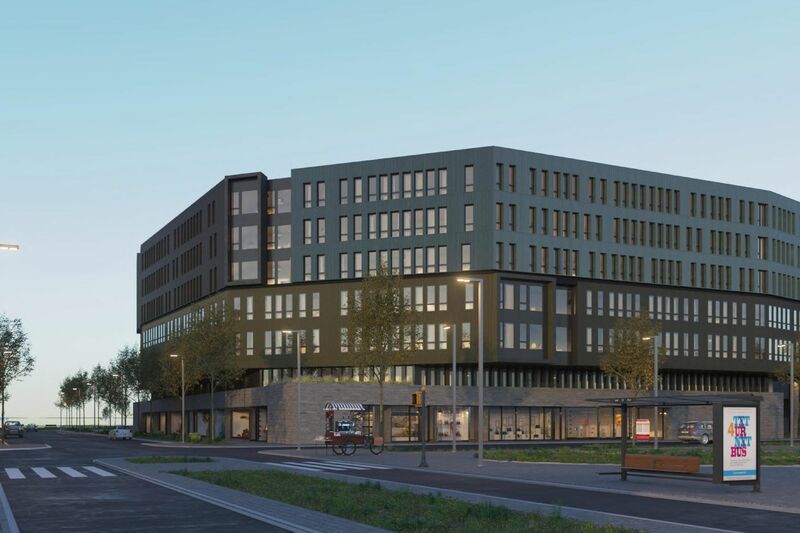 They are also to hold 300 rental units, along with a 186-space parking garage and 20,000 square feet of commercial space, according to the plans. National Realty and U.S. Construction also plan 92 rowhouses, each more than 3,000 square feet, on the northeast corner of the property. Retail venues including a Lidl supermarket are planned along the tract’s western half, along Columbus Boulevard. Artist's rendering of a courtyard between waterfront apartment buildings planned on part of a Delaware River waterfront tract where a Foxwoods casino was once proposed. The 30 visitor apartments in the rental buildings would join more than 1,300 units set aside for such short-term stays across central Philadelphia. The city has seen a recent burst of interest from operators who specialize in managing these accommodations, such as Spokane Valley, Wash.-based Stay Alfred Inc. and San Francisco-based Sonder Corp.
John M. Farina, president and chief executive of U.S. Construction, said his group does not yet have an operator in mind to manage the waterfront visitor-apartment units. An earlier version of his group’s plan for the site, featuring more rowhouses where the apartments are now proposed, had been presented to the Civic Design Review board, which offers nonbinding recommendations on Philadelphia’s biggest development projects as part of the city’s permitting process. The revised version, with the apartments, is scheduled to be presented to the panel April 2. Artist's rendering of waterfront apartment buildings (left) planned on part of a Delaware River waterfront tract where a Foxwoods casino was once proposed. To the right, across an extended Dickinson Street, is a rowhouse enclave that would be part of the same development.